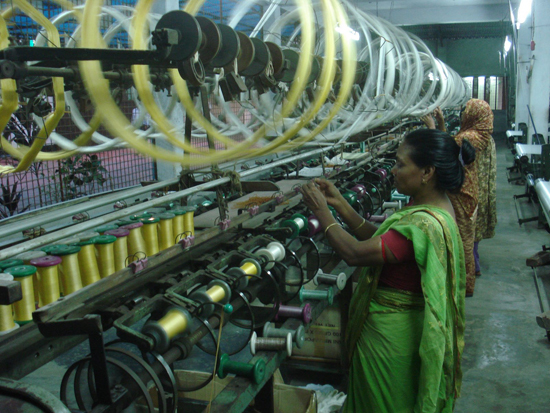 Rajshahi Silk is the name given to the silk products produced in Rajshahi, Bangladesh. It is a famous name in the domain of clothing, especially in saris. Rajshahi silk is a delicate and soft fibre produced from the cocoons of silkworms and is covered with a protein called Sericin. There are mainly three varieties of silks. Among these varieties, Mulberry silk is the finest and is therefore the most valuable. Saris and other products made out of Rajshahi silk are coveted by users in the country and in foreign countries. Rajshahi silk is available as fabric in colors and patterns for designers. Silk fabric is available in ranges for apparel and for other purposes. Rajshahi houses a number of silk industries and a Silk Research Institute. The region's sericulture accounts for almost the entire silk output of Bangladesh. Approximately 100,000 people are directly or indirectly employed in this sector.